Celebrating Christmas and ringing in the New Year of 2019, The Ritz-Carlton, Hong Kong takes festive celebrations to new heights offering an array of international cuisines at fine dining restaurants and an elegant ambience to ensure memories for a lifetime.Embrace the festive mood at Nutcracker Christmas Market running from December 7-8 at the Main Entrance Lobby and get your Christmas shopping sorted with our exclusive selection of gourmet treats, jewelry, accessories, fashionwear and more. Indulge your palate this festive season at The Ritz-Carlton, Hong Kong’s most lauded gastronomic hot spots. Michelin-starred Tin Lung Heen offers gourmet Cantonese delicacies, Michelin-starred Tosca brings you the best of Italian, The Lounge & Bar tempts you with delectable dishes for all palates, Café 103 serves luxuriant feasts and, to top it off, Ozone offers a great party venue with cool vibes, great cocktails and the most glamorous of Christmas Eve and New Year’s Eve parties. Catch Santa Claus as he visits the various gourmet destinations at The Ritz-Carlton, Hong Kong. Highlights of the festive season include a sumptuous Christmas Eve Set Dinner at One Michelin Star Italian restaurant, Tosca, offering six courses of traditional festive delights. 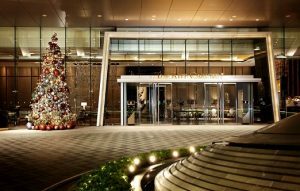 You can also celebrate Christmas Eve at Two Michelin Star Chinese restaurant Tin Lung Heen for delectable Cantonese cuisine. Tin Lung Heen’s Christmas Eve Dinner Menu highlights Chef Paul Lau’s signature dishes Including Double-boiled chicken soup with fish maw in baby coconut, Braised South African abalone with superior sea cucumber in oyster sauce as well as Steamed garoupa fillet with Jinhua ham and superior bird’s nest. Unleash the party animal in you and hit Ozone- the world’s highest bar for “The Wizard of Oz”- themed soiree on New Year’s Eve. International DJs Ari Houmous & Storm Mollison (UK) will spin their magic on the decks for the ultimate countdown to 2019. Be at the top of the world this New Year’s Eve at the highest bar in the world. Toast to the New Year with Dom Pérignon Champagne. Spoil your loved ones at Cafe 103’s New Year’s Day Nutcracker Afternoon Tea and be amazed at the live dessert station counter. Enjoy family fun with your little ones at The Lounge & Bar’s Teddy Bear Afternoon Tea in collaboration with kids fashion label Nicholas & Bears. You won’t be able to resist the cuteness-overloaded Festive Teddy Bear lollipop or the Orange and chocolate festive cupcake. What better ways to kick-start the New Year than indulging in a decadent Champagne brunch? Enjoy New Year’s Day Ultimate Dom Pérignon Brunch at Ozone or the brunch at Tosca with free-flowing vintage Louis Roederer Cristal Rose. Savor a tranquil moment at The Ritz-Carlton Spa, Hong Kong where a wide range of festive-special treatments is on offer. The Christmas Rejoice program will keep you looking and feeling your best. The treatment begins with a luxurious dry body brush to invigorate your circulation and eliminate toxins, followed by a nourishing Meso wrap and finish with a relaxation massage which will leave the skin hydrated and glowing. Spread the festive spirit and treat your loved ones to customized festive hampers overflowing with gourmet confections and lavish items handpicked by The Ritz-Carlton, Hong Kong. The Ritz-Carlton Hamper is truly a bundle of joy featuring delicacies such as Classic panettoncino, whole goose foie gras (120g), Pit and Pita Christmas chocolate puzzle and more.